VPS with pre-installed MS Windows or CentOS Linux operating system in a few seconds from order. 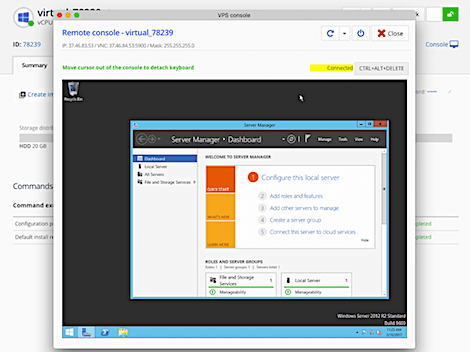 Remotely manage your VPS from anywhere around the world using the VNC console (enabled by default on every VPS) or using RDP (MS Windows) or SSH (Linux). Managing of VPS server can hardly get easier. 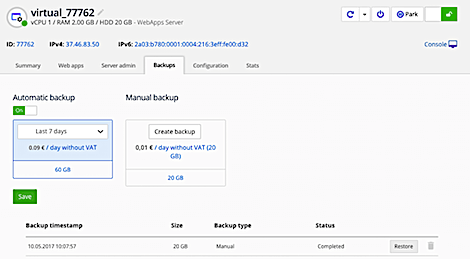 Easy to use management of your VPS from our user interface allows you to power on and off, restart reinstall or revert your VPS without the need to access server console. 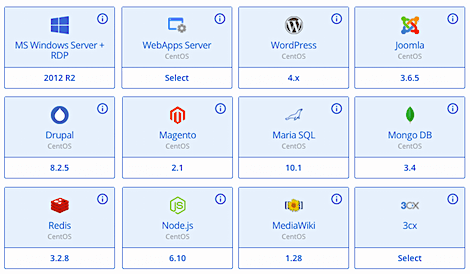 Pre-installed WebApps server available immediately with LAMP (Linux CentOS, Apache, MySQL a PHP). The pre-installed environment also offers Python, PERL, Ruby, phpMyAdmin and other. Manage the pre-installed WebApps server from within our user interface using easy-to-use GUI. 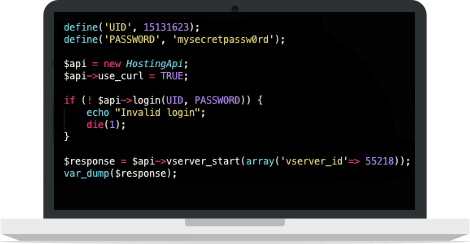 The GUI gives you power over basic MySQL, Apache and PHP settings. You can also set up SSH or use VNC console to perform more sophisticated administrative tasks. 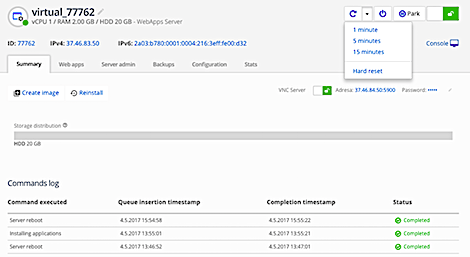 Any pre-defined setting of the WebApps server can be changed. You can also change or update features you need using provided root access to the system. Order and deploy your virtual hardware faster using API. You save time which you can invest in developing the applications for your customers. All administrative tasks which are available from user interface are availabe using API too. Go ahead and integrate our services into your own application. Are you planning on running several servers with identical or simmilar settings? You don't want to spend time setting up the server over and over again? Create a clone of your production environment into a template and use it to create new servers later. Do you need Microsoft Windows environment? Choose one of our VPS Windows plans. If you are in need of a VPS with Linux, feel free to choose from variety of Linux and other OS distributions available for your VPS hosting including CentOS, FreeBSD etc. For a list of supported operating systems and applications. Do your applications need more performance than at the time when you created the VPS? 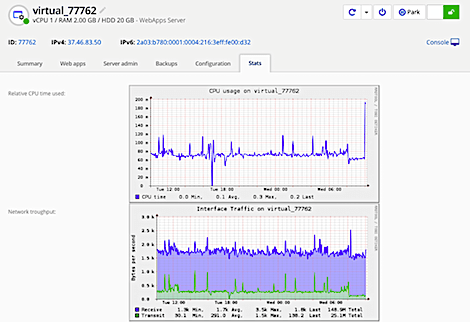 Go ahead and increase performance of your VPS by upgrading to a higher VPS plan with better parameters of vCPU, RAM, SSD, hard drive or traffic. The VPS stays online during the upgrade and only restarts once when the upgrade is finnished to apply the upgraded parameters. 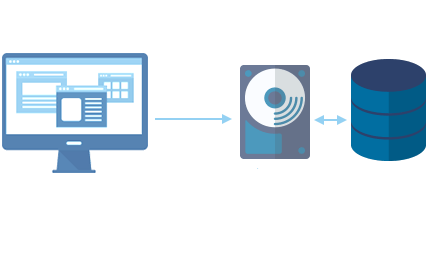 External storage can be connected as an additional network drive with redundantly stored data on disk arrays. 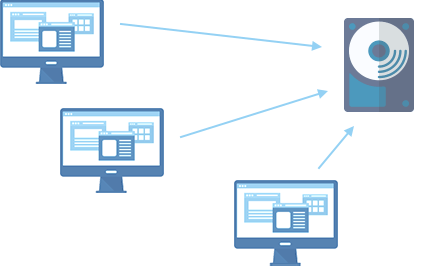 Access is possible through FTP, SMB or NFS. Also from SFTP and RSYNC that can be encrypted and secured through a private / public key. All protocols are protected by a username, password and restricting access from specific IP addresses within the internal network. It is possible to allow access to a multiple users including the ability to set permissions read-only or read-write. It is possible to dynamically increase the storage with blocks of 100GB. 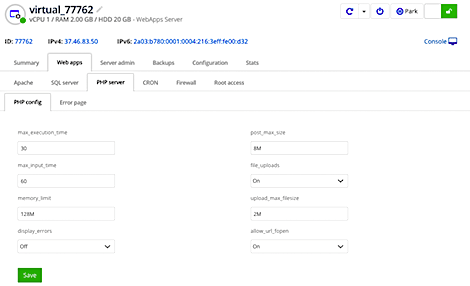 External storage can be connected as an additional network drive with RAID 5 data protection.. Access is possible through FTP, SMB or NFS. Also from SFTP and RSYNC that can be encrypted and secured through a private / public key. All protocols are protected by a username, password and restricting access from specific IP addresses within the internal network. It is possible to allow access to a multiple users including the ability to set permissions read-only or read-write. It is possible to dynamically increase the storage with blocks of 100GB. 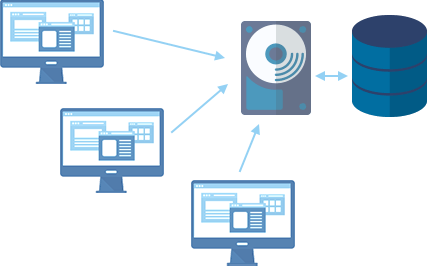 External disk storage with redundantly stored data on disk arrays, which is connected to the virtual server as another drive. This space can be formatted to any file system according to preference. Many applications only supports this approach to further drive and facilitates thus the work within the particular application. It is possible to dynamically increase the storage with blocks of 100GB. 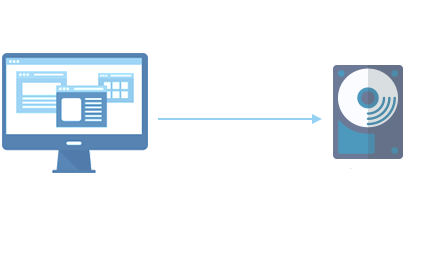 External disc storage can be useful, for example, to back up application data from your virtual server. To achieve maximum performance and security of data, storage is based on RAID array and the virtual storage server connects at speeds of around 100Mb/s as an additional non-redundant disk. It is possible to increase the storage with blocks of 100GB. You can create a virtual network to connect your servers together. By this you gain a completely private network which is not accessible from the internet. With our VPS / VDS you can forget all those headaches with non-functional HW and related downtimes or lengthy RMA processes of your suppliers. All HW is managed from us and continuously monitored to prevent unwanted downtimes. Are you planning to suspend your VPS service but do not want to lose your data, IP address and server configuration? Park your VPS for any time you want and lower the costs to a minimum. Restoring of the VPS is possible anytime just by a click. Technical surveillance is available 24 hours a day, 7 days a week, 365 days a year and is included in the price. Your data is stored in a data center which meets the strictest criteria and certification. All virtual servers are connected to the internet using 1Gbps interface. Our network is connected using multiple 10 Gbps lines. These are conneted to a full circle topology to minimize downtimes in case of our upstream provider's outage. All servers come with native IPv6 support. Each VPS / VDS comes with a public IPv4 and IPv6 address. Additional IP resources may be ordered separately.